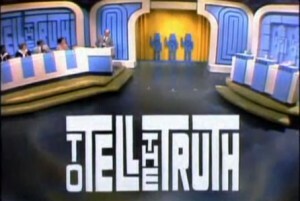 When To Tell The Truth, one of the longest running TV game shows in U.S. history, called Joey Skaggs and invited him to Los Angeles to be a guest, Skaggs could not refuse. In this case however, none of the people who said they were Joey Skaggs, introduced by host Lynn Swan to the celebrity guest panelists David Niven, Jr., Orson Bean, Dr. Ruth, and Kitty Carlisle, were the real Joey Skaggs. Unbeknownst to the show producers and the two hired Joey Skaggs impersonators, Skaggs had sent friend Norman Savage to Los Angeles to appear on the show in his place. Upon accepting the invitation, he’d sent a press kit with Norman’s photo instead of his, plus a tape of a segment from Entertainment Tonight during which Norman had impersonated Skaggs three years earlier. Norman hand-wrote a note to accompany the package so they would have his handwriting and signature on file. He procured a fake photo ID at a head shop in Greenwich Village, which came in handy when he went to pick up the airline ticket in Skaggs’ name. To Tell The Truth producers believed that Norman Savage was Joey Skaggs. Perhaps they should have known better. 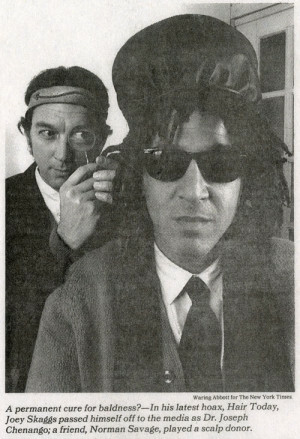 Their inspiration to invite Skaggs came from a December 1990 article in The New York Times, “The Merry Pranksters and the Art of the Hoax“, in which there’s a photo of Skaggs purporting to be Dr. Chenango, Native American surgeon, during his Hair Today, Ltd. hoax. Coincidentally, Savage is also in the photo posing as the scalp donor. 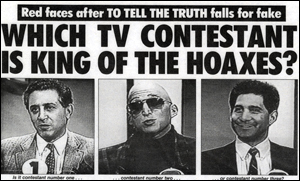 Weeks later, when the show aired, Skaggs revealed to both the producers and the news media that To Tell The Truth had not told the truth.